Here is a fun stamp shaped card that I created with the Sentimentals cartridge, my Gypsy and Cricut, along with the fabulous Viva Decor Pearl Pens from ScrapbookPal. These Pearl Pens are a fabulous way to add texture and shine to your image and they dry in a short amount of time and stay raised...not flat......and the best part is that you can make them any size you want to. Using your Gypsy, Design Studio, or Cricut Craftroom program, weld two of the shadows from the Sentimentals cartridge together at 5 inches and cut out with your Cricut onto white cardstock. Cut out the image at 5 inches in black and adhere to the white card base. Cut out the layer for the image at 5 inches in red. 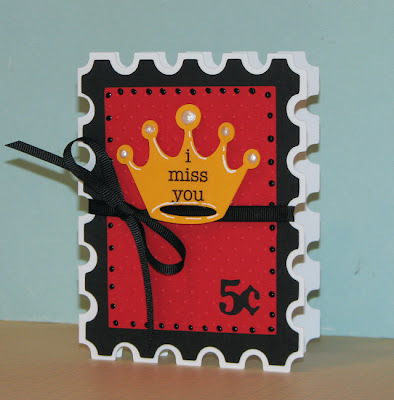 Run this cut through your Cuttlebug with the Swiss Dots embossing folder and then layer and adhere over the black piece. Using the Viva Decor Pearl Pen in black, place little dots along the edges. Add a black ribbon around the center of the card (going through the slots from the stamp image) and tie a bow on the left side of the card. Cut out the crown image at 5 inches in yellow. Place a sentiment in the center of the crown and add some Viva Decor Pearl Pen in cream to the upper portions of the crown as pearl accents. You can also add a few white lines with a white Gelly Roll pen. 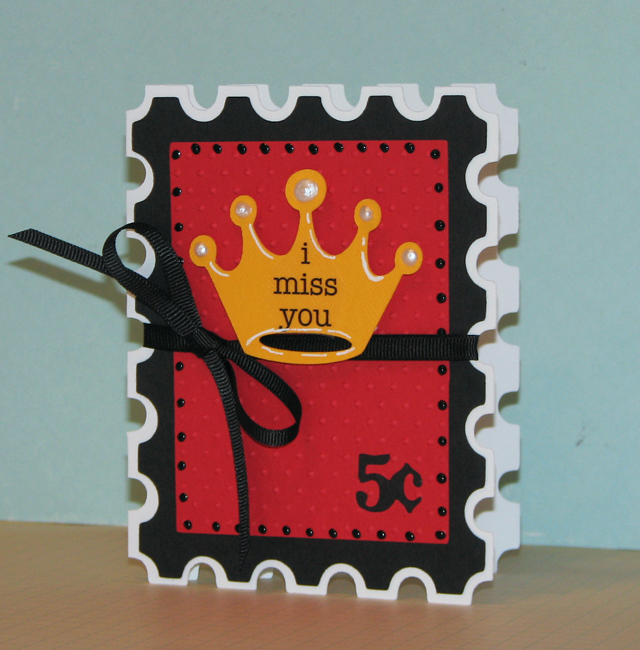 Adhere the crown to the card with dimensional adhesive. Thanks for stopping by!! Don't forget to check out the current specials at ScrapbookPal HERE. I am entering this card in the Lily Pad Cards Ribbon Challenge. This is an adorable card! I never thought about welding two shadows together, boy that opens a whole world of doors. Thanks for the great tip! love the look of this card!! I need to get a lil more creative in these awesome versatile cartridges!! TFS. Great idea! I really like the different shape. This is a really nice card clean and simple. Cute card! I love the Viva pearl pens too:) Great touch! Cute card! Thanks for playing with us at Lily Pad Cards.